John Grant and Maria Vanina Martinez, eds. 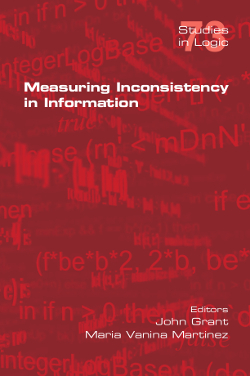 The concept of measuring inconsistency in information was developed by John Grant in a 1978 paper in the context of first-order logic. For more than 20 years very little was done in this area until in the early 2000s a number of AI researchers started to formulate new inconsistency measures primarily in the context of propositional logic knowledge bases. The aim of this volume is to survey what has been done so far, to expand inconsistency measurement to other formalisms, to connect it with related topics, and to provide ideas for further research in a topic that is particularly relevant now in view of the many inconsistencies in the massive amount of information available. >The book contains 11 chapters. The first chapter, by John Grant, gives his original motivation for starting this field, explains why it was formulated in a highly mathematical manner, presents important material that was omitted from the original paper, and provides ideas about the use of dimensions in measuring inconsistency. The second chapter, by Matthias Thimm, is a survey that covers most of the research on inconsistency measures up to 2017. The other 9 chapters, all by experts either in inconsistency measures, or in the topic under consideration, or both, connect inconsistency measures with argumentation, disjunctive logic programming, fuzzy logic systems, modal logics, multiset representation, paraconsistent consequence, probabilistic logic, relational databases, and spatio-temporal databases.